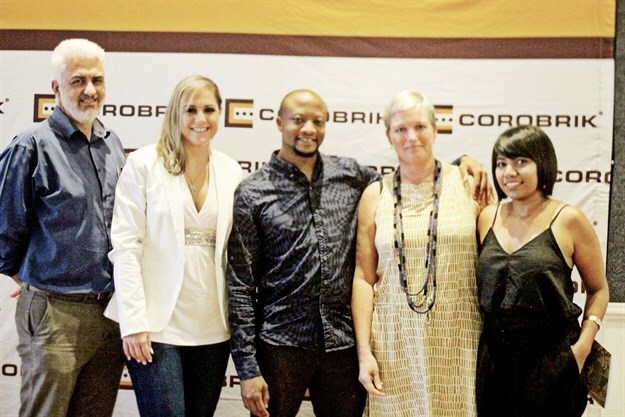 Corobrik is sponsoring a new monthly programme in Glenwood in Kwazulu-Natal, SAIA-KZN First Thursdays, which showcases the work of local architects through a range of evolving themes. The inaugural programme, Changing Colour Exhibition, was launched at The Heritage House in Glenwood on Thursday, 7 March. Pictured at the first event held at the KZN Institute of Architecture offices in Glenwood Durban are from the left Patrick Smith, SAIA-KZN president; Christine van den Bergh, Corobrik; Skura Mtembu, SAIA-KZN vice-president; Jo Lees, SAIA-KZN member; Adheema Davis, SAIA-KZN vice-president. The SAIA-KZN First Thursdays programme, started by SAIA-KZN in conjunction with the Glenwood-based First Thursdays network, will consist of an architectural exhibition, film screening and discussion or activity, all of which is centred on a new theme every month. The March 2019 theme ‘Changing Colour’ is an extension of the work by black South African architects which featured in the Changing Colour Journal. The exhibition runs at The Heritage House, 160 Bulwer Road in Glenwood, and is open to the public, free of charge, from 8am to 4pm, Monday to Friday.